Angiogenesis inhibitors have been currently developed which offer the hope of new treatment options such as diabetic retinopathy, psoriasis, rheumatoid arthritis and cancer. Fungi have been known (as) a wide useful source of antiangiogenic compounds for the development of new pharmaceuticals. Especially, fungal secondary metabolites from extreme environments are remarkable due to their diverse components, which make them interesting candidates for new drug discovery. In this study, in order to discover novel active antiangiogenic compounds, secondary metabolites of halotolerant Aspergillus terreus-2 (hAt-2) were isolated from Tuz Lake in Turkey and ethylacetate extract of hAt-2 was prepared from the isolate of hAt-2 culture medium. Cytotoxicity and cell proliferations were investigated by WST-1 assay and Real-Time Cell Analysis system (RTCA-DP) on Human Umbilical Vein Endothelial Cells (HUVECs). Antiangiogenic effects of the extract on HUVEC cells were evaluated with cell migration and invasion assays by using RTCA-DP analysis which is a new electrical impedance method. Antiproliferative effects of the extract were increased on HUVECs depending on concentration and time and, IC50 value was calculated as 42.13 μg/ml. In the invasion and migration assays, 50 and 200 μg/ml concentrations of the extract were significantly suppressed angiogenic responses on HUVEC. According to our results, hAt-2 extract exhibited significant antiangiogenic effects on HUVEC cells. This finding suggests that hAT-2 extract might be pharmacologically active and the secondary metabolites of hAt-2 extract may have potential as a preventive and therapeutic agent on angiogenesis. Halotolerant, Antiangiogenesis, Aspergillus terreus-2, Human umbilical vein endothelial cell. Angiogenesis is a physiological process including proliferation, migration and differentiation of endothelial cells and is strongly involved in solid tumor formation because it is essential for growth and metastasis of malignant tumors . In the realm of drug discovery, natural products provide a vast pool for screening new antiangiogenic and antitumoral agents including candidate compounds to overcome cancer and also low-toxic anticancer agents from fungi has become one of the research subjects in the current pharmacy field [2,3]. Angiogenesis inhibitors are a novel class of promising therapeutic agents for treating many diseases including cancer. Fumagillin and ovalicin constitute a class of structurally relevant natural products that effectively inhibit angiogenesis by blocking endothelial cell proliferation . Recently, fungi have attracted attention as a substantial source of antioxidant compounds including secondary metabolites [5-7]. Hypersaline environments, have been considered to be populated almost completely by prokaryotic organisms for a long time and fungi that can survive in environments with low water activity were discovered recently . Fungal secondary metabolites from extreme environments are remarkable due to their diverse components, which makes them interesting candidates for the discovery of new angiogenesis inhibitors. In this study, antiangiogenic effects of the secondary metabolites of halotolerant Aspergillus terreus (hAt-2) isolated from Tuz Lake were investigated with Real-Time Cell Analysis system (RTCA-DP) which is using electrical impedance on HUVEC cells. Thus, we aimed to bring different perspective for fungal secondary metabolites, an excellent potential antiangiogenic source of new natural products, isolated from extreme environments. Aspergillus terreus-2 (hAt-2) was isolated from one of the biggest lakes in Turkey, Tuz Lake, located in the Central Anatolia Region. Tuz Lake is an inland hypersaline water body (above 30% salinity) . The stock culture of hAt-2 was grown on the slant of Malt Extract Agar (MEA) and maintained at 25°C in an incubator. The isolates were incubated in static conditions in an antioxidant liquid medium at 27°C for 7 days. After the incubation period, the isolates were filtered with Whatmann No: 1 paper to be separated from micelles. Collected supernatant was extracted with ethyl acetate at 1:1 rate for 3 times. The organic phase was intensified by evaporating in rotavapor (Heidolph, Germany). Also identification of hAt-2 was conducted with classical methods earlier . In our previous study, the antioxidant activity of hAt-2 was determined higher than positive control Butylated Hydroxytoluene (BHT). In this study, fungal ethyl acetate extract was dissolved in DMSO and diluted to working concentrations with fresh medium. Control group (solvent control) was prepared with medium containing 0.1% DMSO. HUVEC (ATCC number CRL-130TM) cells were obtained from American Type Culture Collection (ATCC). Human Umbilical Vein Endothelial Cells (HUVECs) were cultured in 2 mM L-glutamine, 0.1 mg/ml heparin, 1.5 g/l NaHCO3 (sodium bicarbonate), 0.03 mg/ml endothelial cell growth factor and 10% FBS containing F12K medium at 37°C in a humidified incubator with 5% CO2. Cytotoxicity was measured using a colorimetric assay for 96- well plates with 2-(4-iodophenyl)-3-(4-nitrophenyl)-5-(2, 4- disulfophenyl)-2 H-tetrazolium monosodium salt, the WST-1 assay. In this method, the reduced tetrazolium salt is watersoluble . HUVEC cells were seeded in 96-well plates at a density of 5 × 103 cells per well. After 24 h, different hAt-2 concentrations (25, 50, 100, 200 and 400 μg/ml) were added to wells. Plates were incubated for 24 or 48 h. After incubation periods, 10 μl WST-1 solution was added to each well and incubated for 3 hours. The absorbance was measured at 420 nm using a Cytation 3 Cell Imaging Multi-Mode Reader (Bio- Tek) according to the WST-1 kit protocol (Cat. no: 11644807001, Roche). Cell viability rates were expressed as the percentage of solvent control (0.1% DMSO). The measured absorbance directly correlates with the number of viable cells [12,13]. Kinetics of cell proliferation were monitored with xCELLigence RTCA DP instrument which measures electrical impedance across interdigitated micro-electrodes incorporated on the bottom of tissue culture E-Plates. Electrical impedance indicated as Cell Index (CI) value and provides quantitative information about the condition of the cells, involving cell number, viability, and morphology [14-16]. Background of the E-plates (16 well) were measured in 100 μl medium in the RTCA DP station. Afterwards 100 μl of HUVEC cell suspensions were added (20.000 cells/well). Plates were incubated for 30 min at room temperature and Eplates were placed into the instrument and impedance was measured at 1 h intervals. Approximately 20 h after seeding, when the cells were in the log growth phase, the instrument was paused and the cells were treated with 100 μl of medium containing different concentrations of hAt-2 ethylacetate extract (25, 50, 100, 200 and 400 μg/ml) and impedance monitoring continued for another 72 hours. Dose-response curves were generated in order to determine IC50 (the half maximal inhibitory concentration) values during the 24th incubation time. 0.1% DMSO containing medium was used as control group. The electrical impedance was analysed by the RTCA-connected software of the RTCA DP system as a dimensionless parameter called CI. Cell migration and invasion assays were conducted with RTCA DP by using CIM-16 plates that contains microelectronic sensors connected onto the underside of the plate . As cells migrate from the upper chamber through the membrane into the bottom chamber in reply to chemoattractant, they contact and adhere to the electronic sensors on the underside of the membrane, ensuring in a raise in impedance [15,16]. For invasion assay, top part wells of the CIM-16 plate were coated with 20 μl of 20% matrigel and incubated at 37°C, 5% CO2 for 4 h before the experiment. And then for both migration and invasion assays, the wells of the bottom chamber were filled with 160 μl of 10% serum containing F12K growth medium and the top and bottom parts of the CIM-16 plates were assembled together. After the addition of 20 μl serum-free F12K medium to the top chamber wells, the assembled CIMPlates 16 were allowed to stabilize for 1 h at the incubator. After the incubation, HUVEC cells were seeded at a 2 × 104 density per well onto the top chambers of CIM-16 plates in 80 μl of serum-free media, then 100 μl of hAt-2 extract concentrations (25, 50, 200 μg/ml) were added. After stabilizing CIM-plates for 30 minutes at room temperature, the chamber was loaded in the RTCA DP and software was set to collect impedance data, reported as CI values, once every 10 minute for 24 h [14,18,19]. Antimigratory effects of the extract on HUVEC cells were investigated by using The Oris™ Cell Migration Assay kit (Platypus Technologies, LLC., Madison, WI) . Briefly, cells were collected in growth medium at 5 × 104 cells/ml and 100 μl of the cell suspension was added to each well of the Oris plate. After 24 h incubation at 37°C in a 5% CO2 incubator, the stoppers and then current medium were removed carefully from the Oris plate. 100 μl of IC50 concentration of the hAt-2 extract (42.13 μg/ml) and 0.1% DMSO containing control group was added to wells and incubated for another 24 h. At the end of the incubation period each well was stained with 10 μl blue fluorescent Hoechst 33258, for 5 minutes and images were captured and absorbances were measured in Cytation 3 Cell Imaging Multi-Mode Reader (Bio-Tek) using the blue filter cube. Graphics were drawn with Graphpad Prism 6.0 software (GraphPad Software Inc., San Diego California USA) and statistically analysed with one way ANOVA and Tukey’s post hoc test. Results are expressed as mean ± standard deviation and the means of 3 independent experiments (n=8 for WST-1; n=3 for morphological migration analysis), n.s; p>0.05, *p<0.05, **p<0.01 and ***p<0.001 were considered to be significant compared to control group. In order to evaluate the cytotoxic effects of the extract on HUVEC, a WST-1 assay was performed with different extract concentrations. As mentioned before, WST-1 is metabolized by cellular NAD-dependent dehydrogenase into the colored product of WST-1, formazan. The amount of dye correlates with the number of viable cells. According to our results, HUVEC cell viability were significantly decreased by hAt-2 secondary metabolites depending on increasing concentrations and time (***p<0.001) (Figure 1). Cell proliferations were gradually reduced between of 25-400 μg/ml concentrations of the extract. WST-1 results were used as preliminary concentration screening for following experiments. hAt-2 secondary metabolites inhibited HUVEC cell growth, invasion and migration in a concentration and dose dependent manner (Figures 1-5). In order to evaluate the effects of hAt-2 extract secondary metabolites on cell proliferation of HUVEC cells and calculate IC50 concentrations for following experiments, cell proliferation analysis were conducted with RTCA DP system. According to our results, IC50 concentrations of hAt-2 extract for HUVEC were calculated as 42.13 μg/ml for 24 h (Figure 2). Also cell migration and invasion were almost completely inhibited at 50 and 200 μg/ml concentrations according to the control group. This study indicated that the increased inhibitory effect displayed by the extract could have been a result of additive effect of ethylacetate extract which includes fungal secondary metabolites, derivatives and/or synergistic effects among them, or could have been a result of other, totally different compounds. Endothelial cell migration and invasion are important steps of angiogenesis. In order to evaluate the effects of hAt-2 secondary metabolites on angiogenesis, real-time cell migration and invasion assays which are new methods were performed with RTCA DP system on HUVEC cells, The analysis was conducted with high (200 μg/ml), medium (50 μg/ml) and low (25 μg/ml) concentration range including IC50 value which was predetermined as 42.13 μg/ml (Figures 3 and 4). Both cell migration and invasion were decreased depending on the increasing concentrations of the extract. Especially, 50 and 200 μg/ml extract concentrations supressed migration and invasion highly. According to Oris™ cell migration result, HUVEC cell migration was decreased by 35% with IC50 extract concentration (42.13 μg/ml) compared to the control (Figure 5). This result was parallel to RTCA-DP migration analysis. Figure 1: The cells were treated with Aspergillus terreus-2 extract concentration for 24 (A) and 48 (B) h and cell cytotoxicity was determined by WST-1 assay. Results are expressed as mean ± standard deviation and the means of three independent experiments (n=8), *p<0.05, **p<0.01 and ****p<0.0001 were considered to be significant compared to control (0.1% DMSO) group. Figure 2: Real-time monitoring of antiproliferative effects of Aspergillus terreus-2 extract on HUVEC cell line. (IC50: 42.13 μg/ml at 24 h). Results were obtained by using RTCA-DP system (n=8). Figure 3: Inhibitory effects of various concentrations of Aspergillus terreus-2 extract on HUVEC cell migration (A). The slope of the migration curve was calculated using the RTCA 1.2.1 Software (B). 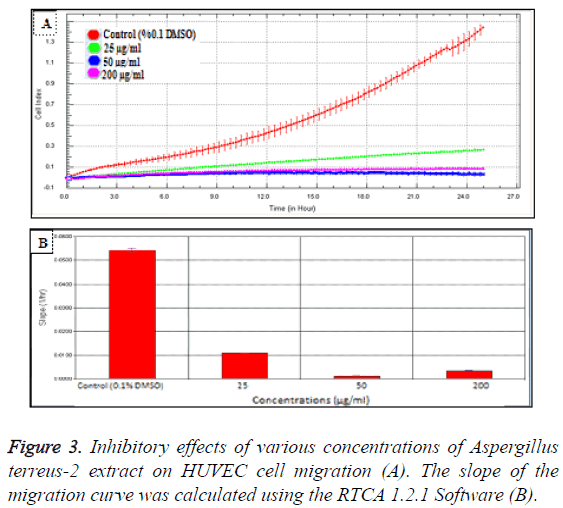 Figure 4: Anti-invasive effects of various concentrations of Aspergillus terreus-2 extract on HUVEC cells (A) The slope of the invasion curve was calculated using the RTCA 1.2.1 Software (B). 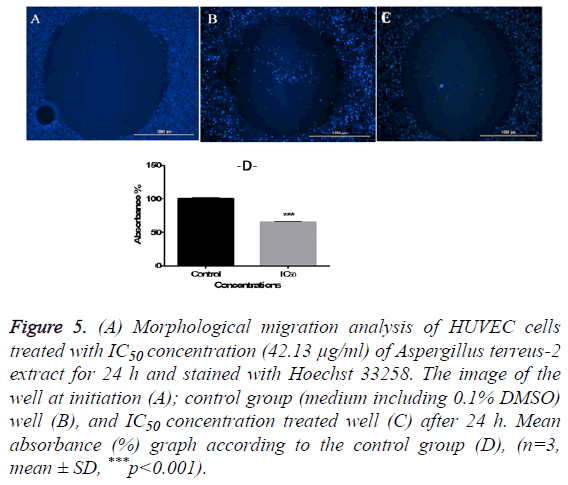 Figure 5: (A) Morphological migration analysis of HUVEC cells treated with IC50 concentration (42.13 μg/ml) of Aspergillus terreus-2 extract for 24 h and stained with Hoechst 33258. The image of the well at initiation (A); control group (medium including 0.1% DMSO) well (B), and IC50 concentration treated well (C) after 24 h. Mean absorbance (%) graph according to the control group (D), (n=3, mean ± SD, ***p<0.001). Angiogenesis inhibition is a promising strategy for the treatment of cancer and several other diseases, including diabetic retinopathy and rheumatoid arthritis . Studies over the past 30 years have provided significant insights about angiogenic process and its role in cancer pathology; angiogenesis is a hallmark of cancer that enables tumor growth. Angiogenesis mechanisms in cells have been an important focus for anti-cancer drug development . However; 40-60% of tumors progressed after initially successful treatment because of the development of resistance to anti-angiogenic therapy, a state exhibiting a poor prognosis and response to available treatments , with heightened invasiveness and in some cases increased lymphatic and distant metastasis . Angiogenesis is a widely regulated process that includes a complex cascade of events and displays an important role in tumor growth and metastasis. It is a key process in the progression of cancer and a very important target for cancer chemoprevention. It was reported that many natural products inhibit angiogenesis. Among the known “natural” angiogenesis inhibitors, polyphenols play an important role [24,25]. Ben et al. showed that secreted secondary metabolites of a Aspergillus fumigatus inhibited HUVEC differentiation, migration, and capillary tube formation in vitro and suppressed angiogenesis in neutropenic mice. Moreover, they explained that gliotoxin has a specific role in mediating the antiangiogenic activity of Aspergillus fumigatus . Also in another study, antiangiogenic activity of the metabolites of Aspergillus fumigatus including fumagillin and gliotoxin were demonstrated . Asami et al. reported the identification of novel angiogenesis inhibitors, epoxyquinols A and B, epoxytwinol A, azaspirene, and RK-805, isolated from fungal metabolites . Also one of the leading angiostatic compound were found as fumagillin and its derivative TNP-470 (7-10), which inhibit neovascularization via endothelial cell cycle arrest . Fungi represent a large group of eukaryotic organisms on earth and serve as biofactories for several bioactive compounds. Secondary metabolites are low-molecular weight bioactive natural products and essential for growth and survival functions of fungi [29,30]. Hypersaline environments originate by the evaporation of water and precipitation of the sodium chloride (NaCl) and eventually results with increasing of the salinity . Fungi from hypersaline environments adapt to high salt condition with its antioxidant capacity . Largely, hypersaline fungal communities are dominated by Aspergillus and Penicillium species . In this study, we investigated the antiangiogenic effects of halotolerant hAt-2 extract secondary metabolites with antioxidant capacity, isolated from Tuz Lake which is a big salt lake in Turkey. Ethylacetate extract of the hAt-2 secondary metabolites showed significant cytotoxic and antiproliferative effects on HUVEC. Especially, hAt-2 secondary metabolites decreased cell viability  and, IC50 concentration was determined as 42.13 μg/ml. Antiangiogenic properties of the extract was demonstrated with HUVEC cell migration and invasion analysis which resulted with significant decrease, especially at 50 and 200 μg/ml extract concentrations. Fungi produce a large variety of secondary metabolites, many of which are used as medicines to treat diseases in humans. For example, lovastatin which is produced by a fungus known as Aspergillus terreus can reduce heart disease risk. However, beside the role of many secondary metabolites are not known , two novel anti-angiogenic fungal compounds, gliotoxin and methylthiogliotoxin, significantly potent inhibitory activities on tube formation, proliferation, and migration of HUVECs . Potent inhibitory activities of two novel antiangiogenic fungal compounds, gliotoxin and methylthiogliotoxin, on tube formation, proliferation, and migration of HUVECs were showed . In conclusion, this is the first evidence for the antiangiogenic effects on HUVEC cells of the hAt-2 secondary metabolites isolated from Tuz Lake. Secondary metabolites of halotolerant fungi, an excellent potential source of new natural products isolated from extreme environments like Tuz Lake may have potential in new drug development. Therefore, with further investigations on the active substance of the hAt-2 extract, it might have an important role as a antiangiogenic agent in the future. However, more detailed evaluation of hAt-2 extract compounds and on antiangiogenic mechanisms of these compounds remains to be investigated. Thus antiangiogenic therapy was postulated to be an attractive approach for the treatment of such as rheumatoid arthritis, diabetic retinopathy and tumor growth and metastasis diseases. The authors declare no conflict of interest concerning this article. Bussolino F, Mantovani A, Persico G. Molecular mechanisms of blood vessel formation. Trends BiochemSci 1997; 22: 251-256. Wang YT, Xue YR, Liu CH. A brief review of bioactive metabolites derived from deep-sea fungi. Mar Drugs 2015; 13: 4594-4616. Chavez R, Fierro F, García-Rico RO, Vaca I. Filamentous fungi from extreme environments as a promising source of novel bioactive secondary metabolites. Front Microbiol 2015; 9: 903. Griffith EC, Niwayama Z, Su S, Ramsay C A, Chang Y, Liu J.O. Molecular recognition of angiogenesis inhibitors fumagillin and ovalicin by methionine aminopeptidase 2. ProcNatlAcadSci 1998; 95: 15183-1518. Jayakumar T, Thomas PA, Geraldine P. In-vitro antioxidant activities of an ethanolic extract of the oyster mushroom, Pleurotusostreatus. Innov Food SciEmergTechnol 2009; 10: 228-234. Davies KJ. Oxidative stress: the paradox of aerobic life. BiochemSocSymp 1995; 61: 1-31. Schloss JV. Oxygen toxicity from plants to people. Planta 2002; 216: 38-43. Jenifer JSCA, Donio MBS, Michaelbabu M, Vincent, SGP, Citarasu T. Haloalkaliphilic Streptomyces spp. AJ8 isolated from solar salt works and its pharmacological potential. AMB Express 2015; 5: 1-12. Gaven K, Mutlu MB, Aarpan C, Kutlu HM. Isolation and identification of selenite reducing archaea from Tuz (salt) Lake in Turkey. J Basic Microbiol 2013; 53: 397-401. Pitt J. A laboratory guide to common penicillium species. Food Science 2000; 197. Yang H, Liu C, Yang D, Zhang H, Xi Z. Comparative study of cytotoxicity, oxidative stress and genotoxicity induced by four typical nanomaterials: the role of particle size, shape and composition. J ApplToxicol 2009; 29: 69-78. Engur S, Dikmen M, Ozturk Y. Comparison of antiproliferative and apoptotic effects of a novel proteasome inhibitor MLN2238 with bortezomib on K562 chronic myeloid leukemia cells. ImmunopharmacolImmunotoxicol 2016; 38: 87-97. Kaya TE, Dikmen M, Ozturk Y. Effects of DNMT and HDAC inhibitors (RG108 and Trichostatin A) on NGF-induced neurite outgrowth and cellular migration. Int J Pharmacol 2016; 12: 351-360. Bird C, Kirstein S. Real-time, label-free monitoring of cellular invasion and migration with the xCELLigence system. Nature Methods 2009; 6. Solly K, Wang X, Xu X, Strulovici B, Zheng W. Application of real-time cell electronic sensing (RT-CES) technology to cell-based assays. Assay Drug DevTechnol 2004; 2: 363-372. Urcan E, Haertel U, Styllou M, Hickel R, Scherthan H, Reichla FX. Real-time xCELLigence impedance analysis of the cytotoxicity of dental composite components on human gingival Fibroblasts. Dent Mater 2010; 26: 51-58. Limame R, Wouters A, Pauwels B, Fransen E, Peeters M, Lardon F, De Wever O, Pauwels P. Comparative analysis of dynamic cell viability, migration and invasion assessments by novel real-time technology and classic endpoint assays. PLOS ONE 2012; 7: 10. Eisenberg MC, Kim Y, Li R, Ackerman WE, Kniss DA. Mechanistic modelling of the effects of myoferlin on tumor cell invasion. ProcNatlAcadSci USA 2011; 108: 20078-20083. Lee E, Koskimaki JE, Pandey NB, Popel AS. Inhibition of lymphangiogenesis and angiogenesis in breast tumor xenografts and lymph nodes by a peptide derived from transmembrane protein. Neoplasia 2013; 15: 112-124. Asami Y, Kakeya H, Okada G, Toi M, Osada H. RK-95113, a new angiogenesis inhibitor produced by Aspergillusfumigatus. J Antibiot (Tokyo) 2006; 59: 724-728. Arjaans M, Schroder CP, Oosting SF, Dafni U, Kleibeuker JE. VEGF pathway targeting agents, vessel normalization and tumor drug uptake: from bench to bedside. Oncotarget 2016; 7: 21247-21258. Hu YL, Jahangiri A, DeLay M, Aghi MK. Tumor cell autophagy as an adaptive response mediating resistance to treatments such as antiangiogenic therapy. Cancer Res 2012; 72: 4294-4299. Pàez-Ribes M, Allen E, Hudock J, Takeda T, Okuyama H, Viñals F, Casanovas O. Antiangiogenic therapy elicits malignant progression of tumors to increased local invasion and distant metastasis. Cancer cell 2009; 15: 220-231. Fotsis T, Pepper M, Aktas E, Breit S, Rasku S, Adlercreutz H, Wahala K, Montesano R, Schweigerer L. Flavonoids, dietary derived inhibitors of cell proliferation and in vitro angiogenesis. Cancer Res 1997; 57: 2916-2921. Kandaswami C, Lee LT, Lee PP, Hwang JJ, Ke FC. The antitumor activities of flavonoids. In Vivo 2005; 19: 895-909. Ben-Ami R, Lewis RE, Leventakos K, Kontoyiannis DP. Aspergillusfumigatus inhibits angiogenesis through the production of gliotoxin and other secondary metabolites. Blood 2009; 114: 5393-5399. Ito JI. Enhancing angiogenesis in invasive aspergillosis: a novel therapeutic approach. J Infect Dis 2013; 207: 1031-1033. Sin N, Meng L, Wang MQ, Wen JJ, Bornmann WG, Crews CM. The anti angiogenic agent fumagillin covalently binds and inhibits the methionine aminopeptidase, MetAP-2. ProcNatlAcadSci USA 1997; 94: 6099-6103. Demain AL. Regulation of secondary metabolism in fungi. Pure ApplChem 1986; 58: 219-226. Phainuphong P, Rukachaisirikul V, Saithong S, Phongpaichit S, Bowornwiriyapan K, Muanprasat C, Srimaroeng C, Duangjai A, Sakayaroj J. Lovastatin analogues from the soil-derived fungus Aspergillussclerotiorum PSU-RSPG178 J. Nat Prod 2016; 79: 1500-1507. Oren A. Diversity of halophilic microorganisms: environments, phylogeny, physiology, and applications. J IndustMicrobiolBiotechnol 2002; 28: 56-63. Ravindran C, Varatharajan GR, Rajasabapathy R, Vijayakanth S, Kumar AH, Meena RM. A role for antioxidants in acclimation of marine derived pathogenic fungus (NIOCC 1) to salt stress. Microbial pathogenesis 2012; 53: 168-179. Leitão AL, García-Estrada C, Ullan RV, Guedes SF, Martín-Jimenez P, Mendes B, Martín JF. Penicilliumchrysogenum var. halophenolicum, a new halotolerant strain with potential in the remediation of aromatic compounds in high salt environments. Microbiol Res 2012; 167: 79-89. Vanden HJP, Thompson TS, Curtis JM, Ibrahim A, Pernal SF. Fumagillin: an overview of recent scientific advances and their significance for apiculture. J Agric Food Chem 2014; 62: 2728-2737. Gressler M, Meyer F, Heine D, Hortschansky P, Hertweck C, Brock M. Phytotoxin production in Aspergillus terreus is regulated by independent environmental signals. Elife 2015; 4. Lee HJ, Lee JH, Hwang BY, Kim HS, Lee JJ. Anti-angiogenic activities of gliotoxin and its methylthioderivative, fungal metabolites. Arch Pharm Res 2001; 24: 397-401.